The Peony Nine Patch quilt block is another to add to your collection of flower quilt blocks. 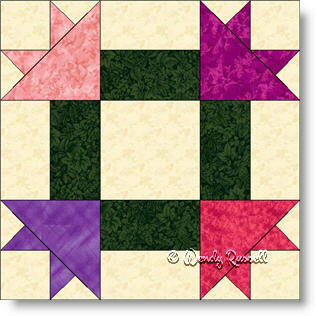 This block is easy to construct and gives you more practice using quarter square triangles and half square triangles as cut pieces -- not as the usual completed square. I chose to use a variety of fabrics for the "peonies" -- and tried to use colours that are found in nature. However, you may choose to make all of the blooms in the same colour. The two sample quilts illustrated both give the impression of "plaid" when you step back and look from a distance. I just like how it all went together.